There is one ingredient that every single crop is absolutely dependent on – water. Producers have implemented irrigation and fine-tuned cultural practices to make the most of available moisture, but soil conditions and unpredictable rainfall can still make crops vulnerable to yield-reducing drought. Plants also lose gallons of water daily through transpiration. Transpiration, or the loss of water through plant tissue, accounts for more than 98 percent of water taken up by plants. 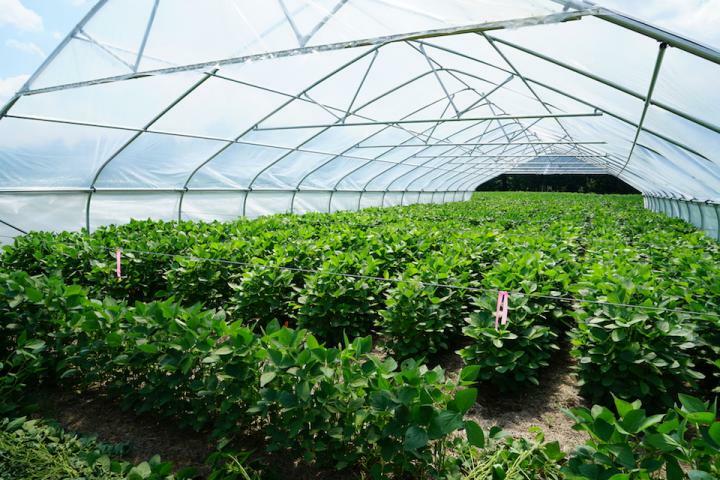 "Identifying plant physiological traits that minimize the impact of drought appears to be the best bet for increasing yields under water deficit conditions," says Avat Shekoofa, assistant professor with the University of Tennessee Department of Plant Sciences. "One trait that shows great potential for conserving water among row crops is limited transpiration under high atmospheric vapor pressure deficit." Vapor pressure deficit (VPD) is the difference between the water vapor pressure inside the leaf and the water vapor pressure of the air at a certain temperature. Under high VPD conditions, which typically occur in the middle of the day, water transpires through plant tissue, specifically stomata. However, crops that exhibit the limited-transpiration trait will restrict transpiration during high VPD conditions by partially closing their stomata, thus conserving soil water levels for later use. "When the stomata partially close, instead of losing water through transpiration, those plants are able to save that water for later in the season and can sustain productivity through the grain fill stage," says Shekoofa. Conserving water while sustaining crop yields is not just a farmer concern – it's a humanity concern. With a growing world population and finite land and water resources, identifying crops with water saving potential could be a central issue for the future of food and water security. Shekoofa has studied the response of transpiration rate with increasing VPD in several crop species, including soybean, corn, sorghum and peanut. In a 2017 study at the West Tennessee AgResearch and Education Center, she tested six cotton cultivars for the expression of the limited transpiration trait and observed it in one (Phytogen 490 W3FE). This is the first time this trait has been observed in a commercially available cotton variety in the Mid-South. "More than 92 percent of cotton production in my state of Tennessee is dryland, and producers have few options to mitigate drought stress," says Shekoofa, who presented these findings at the 2018 Beltwide Cotton Conference. "As with any crop, identifying a variety that exhibits high water saving potential will be helpful to producers who are looking to sustain production through future droughts. For example, one demonstrated advantage of DuPont Pioneer's AQUAmax maize hybrids is their expression of the limited-transpiration trait." While the limited transpiration trait has been identified in multiple crops, it is not widely available in commercial cultivars. Shekoofa says the next challenge is applying the trait in breeding programs. There are questions as to how readily it will be available to progeny lines, but according to a study co-authored by Shekoofa in the January issue of the Journal of Crop Improvement, there appears to be a strong possibility of transferring the limited transpiration trait to progeny. "The results showed that with one parent exhibiting the limited transpiration trait, a reasonable percentage of progeny expressed a breakpoint that would achieve drought tolerance in the field. This is encouraging for future drought-tolerant crop research." Shekoofa will continue her research with a focus on identifying limited transpiration traits in soybean and cotton varieties. This research was funded in part by Cotton, Incorporated.